DESPITE WHATTHE CATEGORIES IMPLY, tile dlstintfon between hardwoods and softwoods has to do with leaf type and Is not a measure of wood hardness. Oak, a common hardwood, has broad leaves that shed In the fall, while pine, a coniferous softwood, retains its needles all winter. PARI OF IDE ATTRACTION OF WOODWORKING comes from the opportunity to work with wood displaying dramatic differences in color, figure and grain pattern. 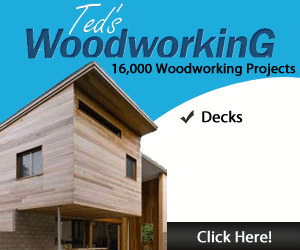 Wood color Is a product of of how Its tannins, gums and resins react to exposure to the air. Often, wood will continue to darken and change color over time, developing a rich patina. Figure-the surface pattern on a board—can be the result of numerous natural causes ranging from drought or freezing to prevailing winds, disease, age or Insect damage. 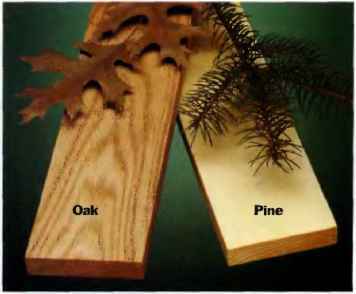 Grain display is dependent on the direction and regularity of the wood fibers relative to the center of the trunk as well as haw the lumber is cut from the tree. Botanicalfy speaking, trees are categorized as either hardwoods or softwoods. Here's a simple way to distinguish the two: hardwoods are deciduous (broad leafed), generally losing their leaves in late fall and reproducing with flowers and fruit1? or nuts. Softwoods, on the other hand, are coniferous; they retain their needle-shaped leaves in the winter and reproduce by spreading their seed through open cones. The terms 'softwood' or 'hardwood' have nothing to do with whether the wood is physically hard or soft. All trees have two growth spurts each year. Their spring growth produce« a light-colored material between the rings, called early wood. The more dense cells produced in the late summer and fall are known as latewood, and these constitute the darker rings that every child has counted to determine a t ree's age. Softwood trees tend to grow more rapidly than hardwoods, and they have wider bands of earlywood than most slow-growing hardwoods. 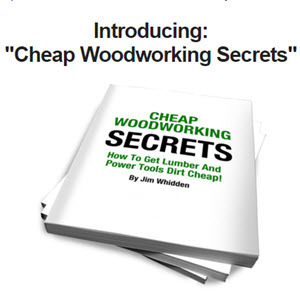 Softwood trees also have larger, less dense cells in the earlywood than hardwoods. This helps explain why a nail can be driven into a wide-celled pine board more easily than a tight-grained oak board; the cell structure is less dense, allowing easier penetration. Another property worth noting is that hardwood trees allow their branches time and space Lo grow in almost any direction, in order to maximize leaf exposure to sunlight. 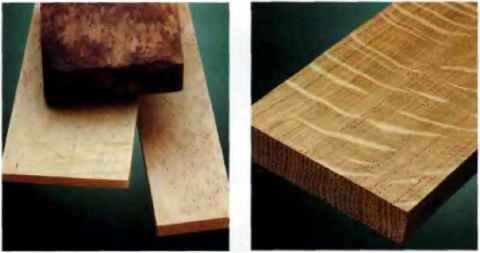 The internal stresses present in the wood, resulting from the weight of these outspread branches, create interesting figure and grain patterns in the; wood (See below; left). However, there is a price to pay lor that beauty: highly figured wood tends to distort more readily than straight-grained boards as the stresses are released. Three centuries ago, colonial woodworkers cut their lumber from vast tracts of virgin coniferous forest. It wasn't uncommon for them to glean white pine boards measuring 2, 3 and even 4 ft. wide, with no knots or other disfigurement. It's no surprise that much of the! r early furniture was built from softwood. Boards culled from today's replanted pine forests, on the other hand, have knots every 12 to 18 in. along their length tone year's growth). Because of their minimal girth at harvest, boards often contain considerable sap-wood as well. WALNUT has rich, dark tones when top-coated. Grain is relatively straight. Moderately easy to work. Moderate to expensive. Species shown is black walnut. Wood finishing can be tricky and after spending hours on building your project you want to be sure that you get the best outcome possible. 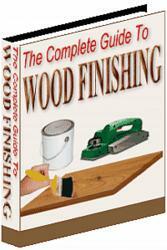 In The Complete Guide To Wood Finishing you will learn how to get beautiful, professional results no matter what your project is, even if you have never tried your hand at wood finishing before. You will learn about every step in the wood finishing process from a professional wood finisher with years of experience.